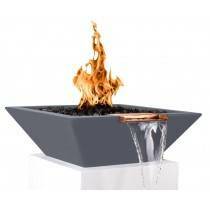 Square Pool Fire Bowls with Scuppers - At Outdoor Fire and Patio, we want every product you purchase to give you years of enjoyment, so we offer only the highest quality in all our products. Our square fire bowlsfor pools with scuppers are no exception, and when installed as part of your pool fire feature design, create ambiance and character to an area that is meant for utter relaxation. 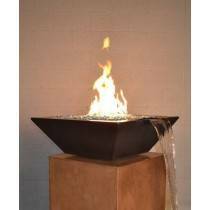 Our square fire bowls for pools come in a variety of sizes, so no matter how big or small your pool or yard, we have the design to match your application. If you aren't sure which size is right for you, call our technicians seven days a week for expert advice we'll guide you through our selection of safe, reliable fire feature products!. 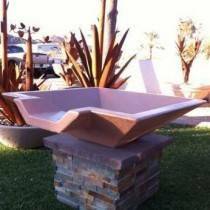 We'll help you determine the perfect square pool fire bowl with scupper to make your outdoor space uniquely beautiful.Ordering is easy. Simply select the style, size, and color you want. 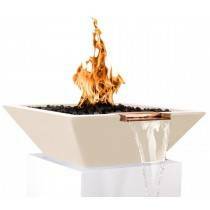 Add accessories for extra beautification, such as fire glass or lava rocks. 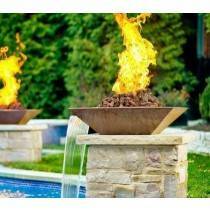 Looking for Round Pool Fire Bowls? 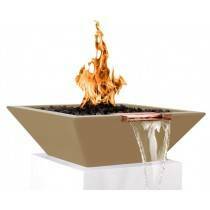 Concrete Pool Fire Bowl Square with Scupper 30"
Concrete Pool Fire Bowl Square with Scupper 36"